Kindly do a news article of about 300 words from the provided information as a punchy news story and do a feature article of about 1,200. 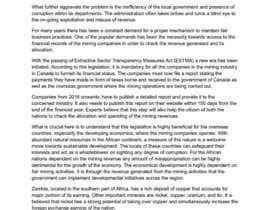 You may put in background information regarding Canadian companies operating in African countries such as Zambia. This is a critical piece of legislation that ultimately will also make host governments more accountable to their citizens. o Taxes Borne – taxes the company pays out of pocket; income tax, royalties, employer pension contributions. • Reporting will have to be provided to the Ministry and posted to the company’s website within 150 days of the financial year end (end of May). • First year of reporting is 2016. 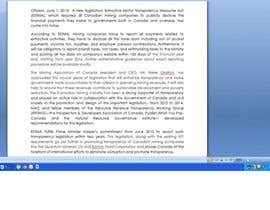 • Detailed administrative guidance of exactly how the reporting will be implemented is forthcoming. 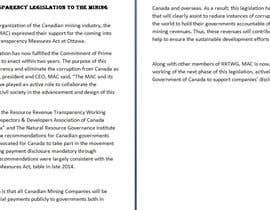 This legislation, along with the existing EITI requirements go yet further in promoting transparency of Canadian mining companies operating in other countries such as First Quantum. 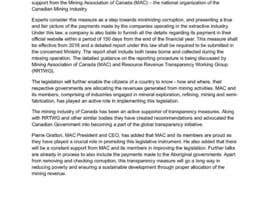 Crucially: this enhanced transparency that will result from this legislation will help reduce instances of corruption by enabling citizens around the world to hold their governments accountable for how they allocate and spend mining revenues. See attachments for your use.